So what do you when you can’t sleep? Try to fall back to sleep? Watch TV? Read? Stare at your ceiling fan, asking the Big Guy upstairs why you are awake after being asleep for only 4 freaking hours? – Yeah, I asked that question, out loud, and got no answer…I was peeved. Other than the question asking, I did none of the above. Nope. A girl has to eat. 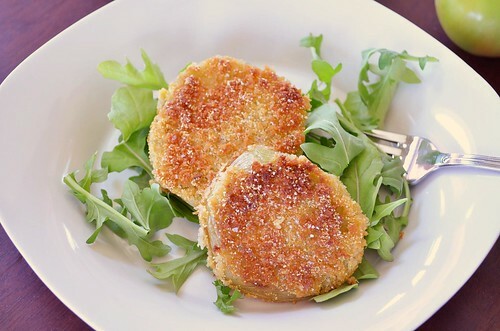 Have you ever tried fried green tomatoes? No? 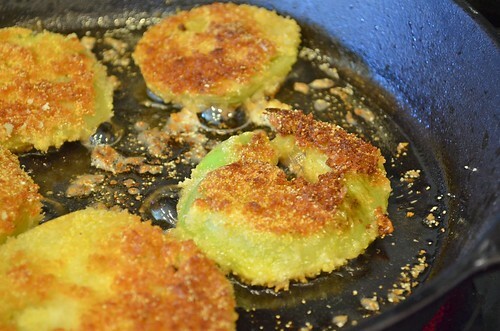 You are missing out and need to find yourself some green tomatoes. Simple as that. 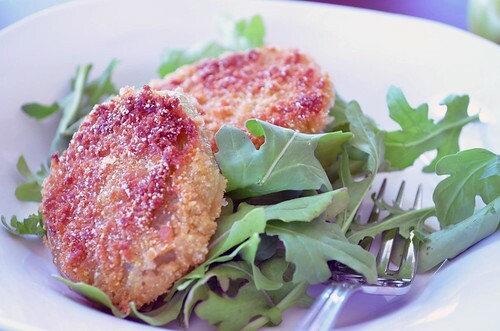 I haven’t found many people – outside of my family- that have tried fried green tomatoes. It is a southern dish and since northern Ohio isn’t exactly in the south..well, lets just say I wasn’t exactly surprised. They are strange looking, yep. Green, very very green. And firm, like freakishly firm – crisp apple firm. 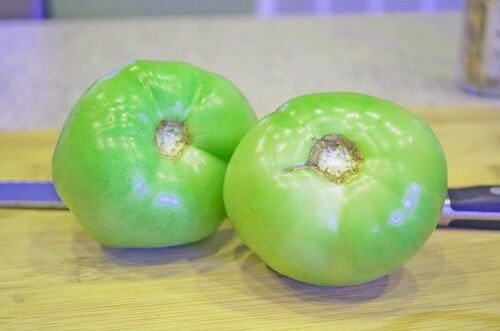 They actually resemble a granny smith apple not a tomato… Its weird but right. Just buy them, slice them, fry them, and devour them. Plus, if you are eating a fried vegetable, its still counts as a vegetable serving. Right? Right?!? Man I hope so….Wait…aren’t tomatoes fruit? Hmmm…. Station 3: Cover in bread crumbs and corn meal. Tip – Do all the work with one hand, therefore keeping one hand clean to answer the phone, take pictures, get hair out of your eyes. You know … important stuff. Then eat them. I like putting mine atop a salad. Its like a diet coke with a Big Mac and large fry. 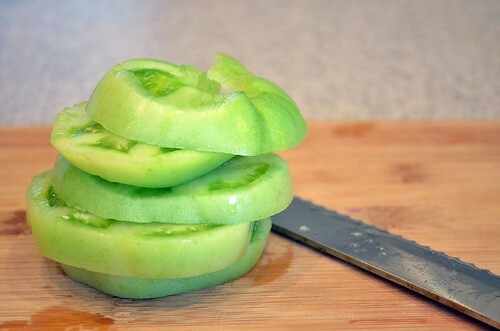 Core tomatoes and cut into 1/2 inch slices (guess, no ruler needed). Lay flat and sprinkle with salt and let sit for about 5 minutes. Meanwhile, prepare your batter stations. 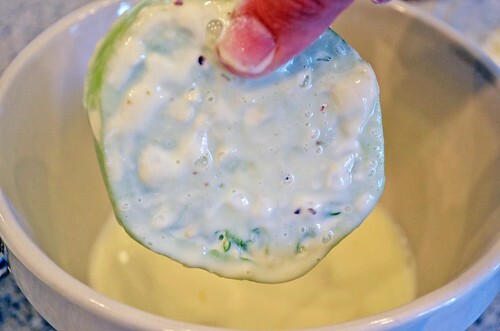 In separate shallow bowls or pie plates mix together 1) flour with seasoning 2) buttermilk/milk with egg, whisk to combine 3) bread crumbs with corn meal. Line them up in this order. Heat oil over medium heat, in skillet – cast iron works well. 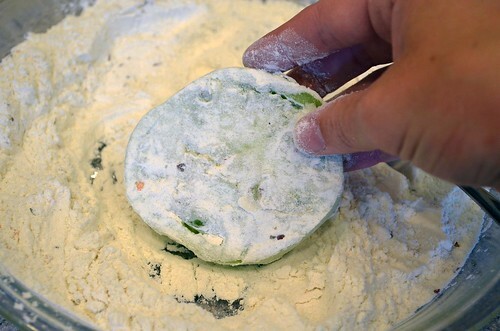 Dredge tomato slices in flour, shake off extra. 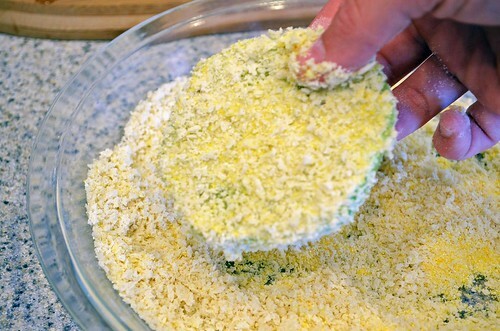 Dip into the milk and egg mixture and then finally into the breadcrumbs/corn meal. Place tomatoes into oil, cooking on each side for about 3 to 5 minutes or until golden brown on each side. Do not over crowd pan and cook in batches if necessary. When done, remove from pan and let rest on paper towel to drain. Sprinkle with salt immediately. 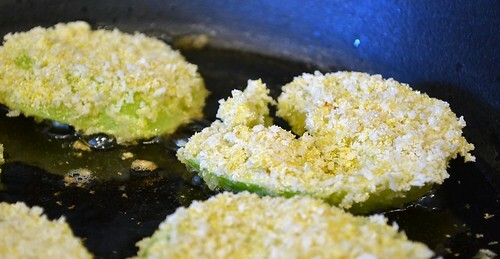 Oh another question…in the movie, Fried Green Tomatoes – do they ever eat or prepare fried green tomatoes? I might have to re-watch the movie…just add that to the list.